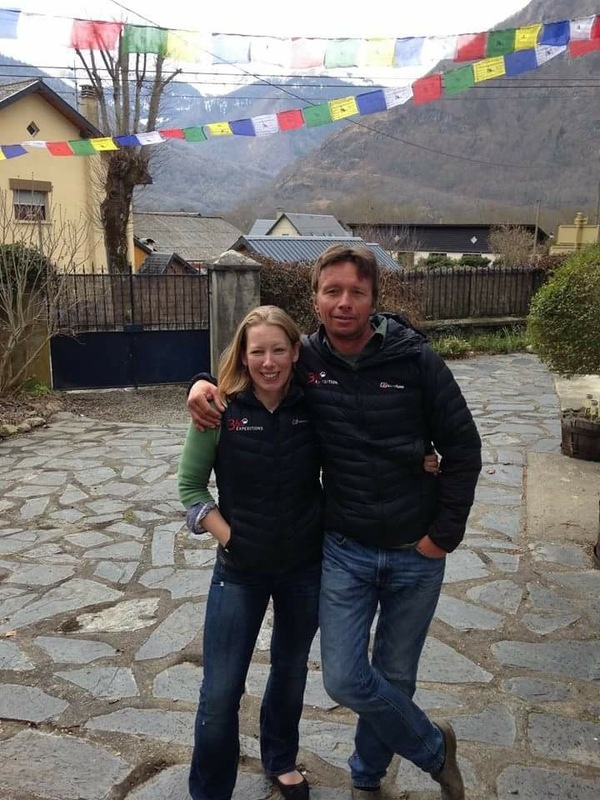 Having been asked if i’d be interested in this trip by my recently befriended mountain mentor Jo Bradshaw (who leaves to climb Everest and Lhotse in a spectacular twofer in 2 weeks time), i was moderately excited about it to say the least. 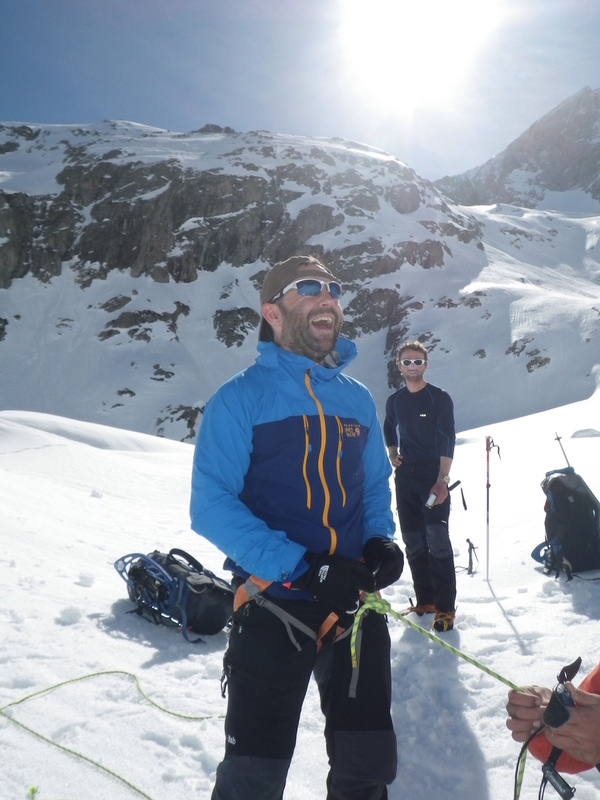 We arrived in beautiful Luchon on the fringes of the Pyrenees last Saturday to weather so hot we had to change into whatever lightweight gear we had (this was a WINTER skills course!). We then spent the afternoon rock climbing, belayed by Rolfe Oostra our chief guide and whose house we were staying in, and also in whose hands our relatively novice asses were in for the next week. Rolfe is a crazy guy in the best possible way. He is a force of nature with a huge heart and a climbing and adventure CV so long it fully justifies his own statement about himself that in the 25 years since he left Australia, he’s been ‘on the road’. The guy drops stories of wandering round in the Amazon for months on end and being held up in the Congo by 13 years olds with AK47s and Mickey Mouse t-shirts as if they were ten a penny in his life. 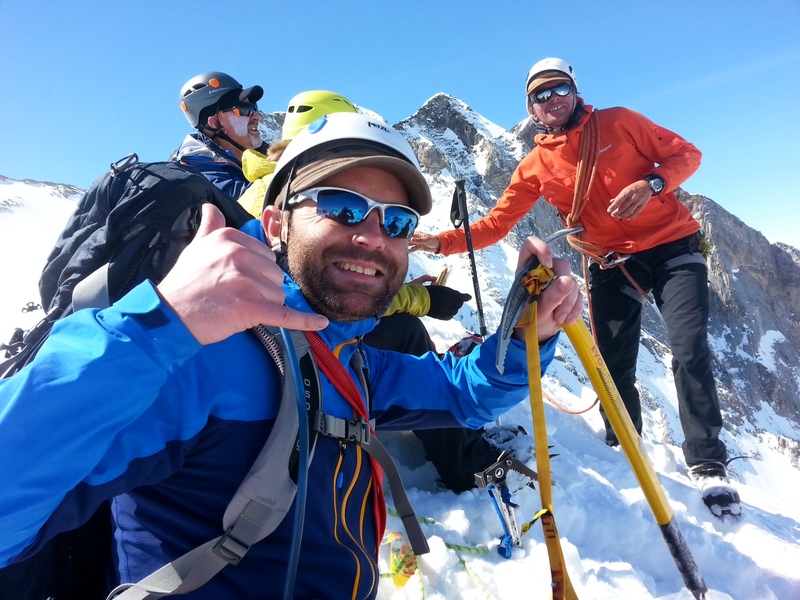 He’s a Berghaus sponsored athlete too and a well know climber and adventurer. In short, he’s a bit of a legend. Helping Jo and Rolfe was Hugo Turner (Turner Twins) from 360 too…. apart from breaking his neck at 17, rowing the Atlantic with his twin brother and attempting to cross Greenland in vintage survival kit (he’ll be doing the same on Mt Elbrus in 3 months time) he’s done absolutely jack so far in his life. 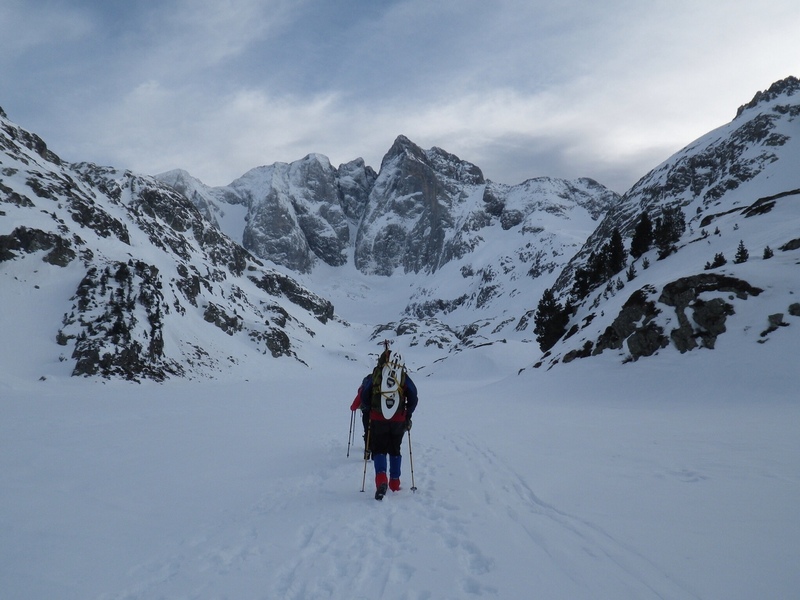 So in this esteemed company we set out on snow shoes from the ski resort of Cauterets up into the forest and on higher to the Vignemale massif where we would be based for the week. That day was a total slog being it was the first time some of us had trekked in snow shoes and we were carrying 16-18kg of load in our packs. We put on i guess about 8 or 900m of height on a trek of about 12 – 14km in the snowy stuff and it took 6 full hours. On the way in, Rolfe gave us a lecture on avalanches and what to look out for. What we didn’t need to look too hard for were signs of said avalanches as several had torn through our path in recent times and the destruction was clear to see… 30 year old trees snapped like matchsticks and the tops of other trees peaking out of the snow like new born saplings. Impressive and sobering stuff. Needless to say when we did hear the occasional crack of avalanches nearby during the week, everybody’s breath and heart stopped immediately and all eyes scanned the higher slopes above us just in case! 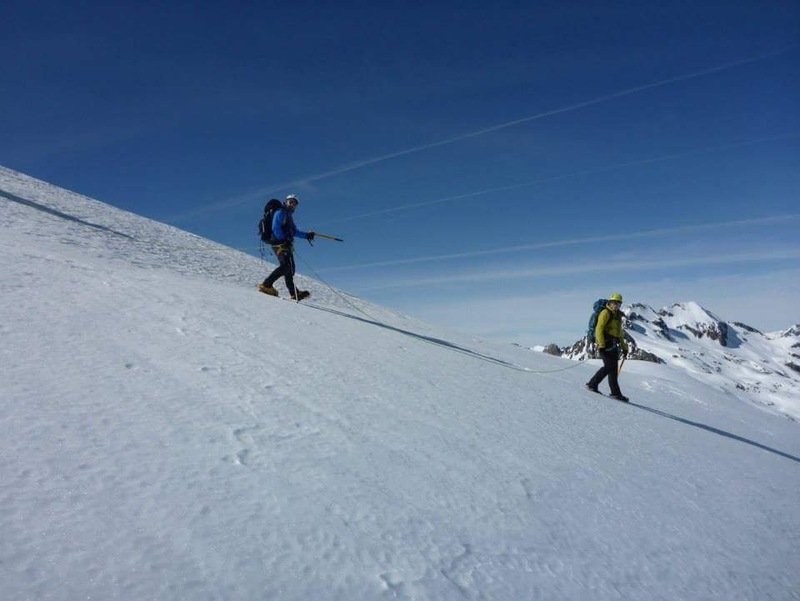 One interesting fact about avalanches is that for every 10 mins in the snow pack after being hit(assuming you survive the impact) your chances of survival drop by 30% with suffocation, internal bleeding and hyperthermia being the main killers! The other interesting fact about them is that the stats say the few survivors (i think he said there was a 20% survival rate) are always the most competitive people as they do everything in their power not to be beaten by the thing. Rolfe had in the preceding days dug his way into the refuge where we would be staying for a couple of nights as the amount of snowfall in previous weeks had been extreme. The quality of the mountain refuges in the region are well known but in the winter they are isolated and damn cold places with limited to no electricity and in some, no light after dark bar the glow of head torches and the cooking stove. Despite a tonne of blankets I spent a very cold night in temperatures known in the UK as ‘Brass Monkeys’. This was to be the pattern each night up there and that despite wearing a full thermal layer too! The next day was spent learning different types of anchor, self arrest techniques (i.e. how to stop falling off a mountain by slamming your ice axe into the deck and getting all your weight onto it within 2 seconds), abseil and crampon techniques over mixed ice/snow terrain and crevasse self rescue using prusik loops. It was really good fun, and courtesy of our Razia (who at times could not effectively self arrest!) it was also peppered with hilarity as she span off down the slopes to the words of ‘you just died’ from Rolfe. The following day we roped out for crevasse travel and headed up the closed glacier and up onto the moraine to take the ridge up to the col some 500m or so higher and from where we would head down a little to stay in the next refuge for the night ahead of going for the summit of Petit Vignemale (3032mt) the day after. This seemingly innocuous run up was a little hairier than i had personally expected as a result of this being the first time for most in traversing mixed steeply angled icy terrain with points and packs on. It served to bring all to alert and focus the mind on the challenge to come the following day. That night we played sh*thead (cards! ), i experienced one of the world’s most spectacular toilet vistas and all the amateurs nervously considered what was to come in the morning. 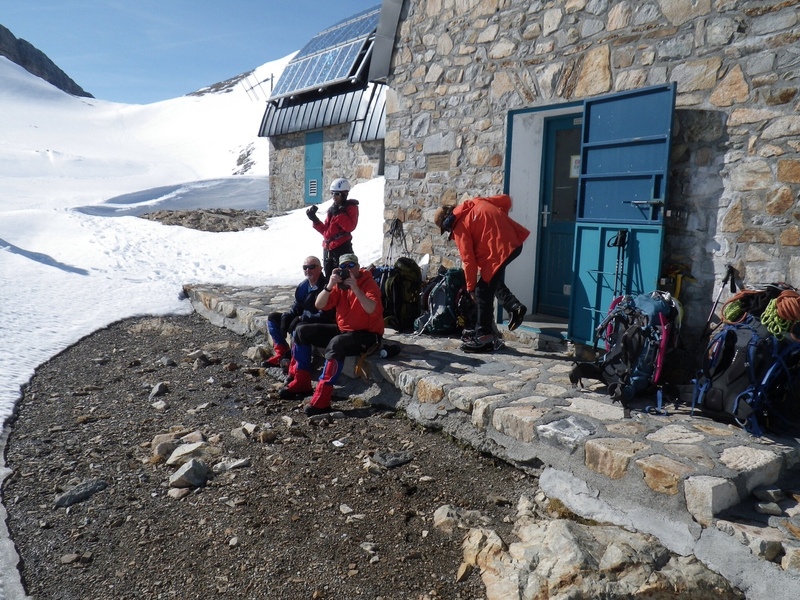 Namely, a 4 hour slog up 30/45 degree slopes of snow, ice and rock to the top. I’m not ashamed to say i was seriously nervous about it. Part of my challenge with this climbing lark is i’ve a less than optimal head for heights. That’s something i have to overcome. Looking me in the eye, Jo, knowing what was going through my head, repeated one of her excellent personal mantras to me….. ‘put a lid on fear’. Fear is irrational.. that’s why it’s tough to put a lid on but you have to find a way otherwise it can take you over. Your mind is playing games you don’t know how to rationalise and in the end i found the best way to get through the ‘iffy’ moments was to simply ignore them and to focus on the rhythm of ‘one foot after another’ all the way to the top. Summiting was all a little unreal in the end. Amidst 150% concentration, the words..’we are about to summit’ permeated my head and i looked around and suddenly realised we’d gotten up the damn thing! The yawning North face of the Grand Vignemale stretched out below off one side, and, a lesser if no less impressive drop to the glacier to the other side greeted us. The view was stunning… ‘peak after peak after peak after peak…’ as Rolfe put it. As we sat there and broke out the dry crackers and garlic sausage to get a few calories in before descending it was hard not to be a little awed by our surroundings and unfortunately the pictures we got really don’t do it justice. Fortunately the camera of the mind records images of far more detail and, more importantly, with your own emotional filter. I won’t forget that half hour up top. There are many more stories to tell and so many comedy gold moments (most unrepeatable) but i’ll end this account with one of my faves. 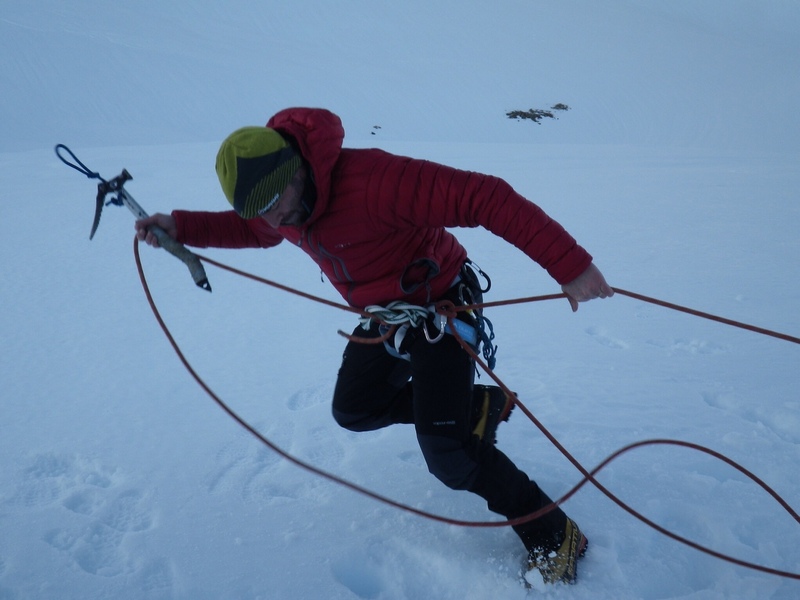 On the way out on the last day Rolfe set up an anchor to belay us up for some ice climbing training. You can see this in the pictures i’ve attached. After i blasted up to the top, i let my ice axes dangle and grabbed the rope with both hands to abseil down. 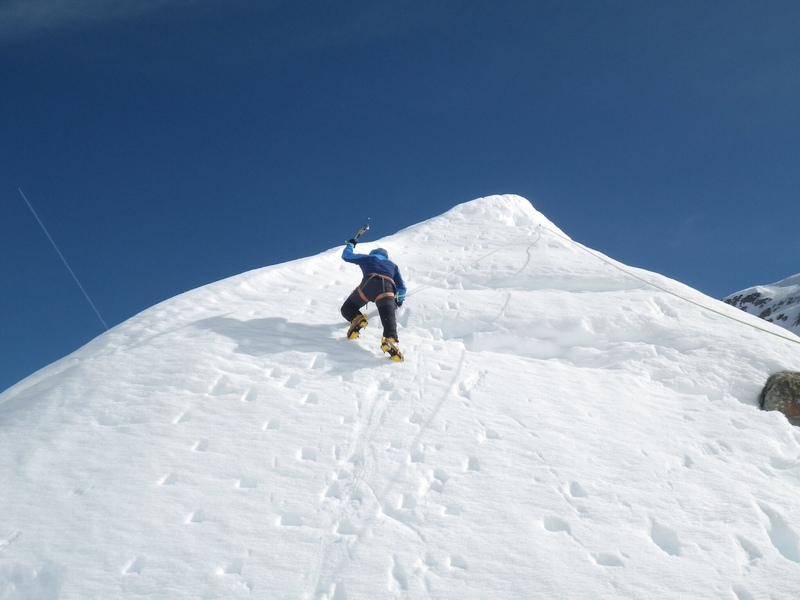 With the sun blaring down on the snow pack on top and with the snow pretty disturbed up there during the set up, about 2 steps into the descent the dead man anchor plate at the top popped out and a second later with ice axes blurring all around me i hit the deck with a fair thud. Concerned, the others rushed to check i was ok. What did Rolfe say to me….’Why didn’t you self arrest man?! !’ i nearly choked with laughter as you can see from the pics. The fall was captured on video. It’s hilarious.